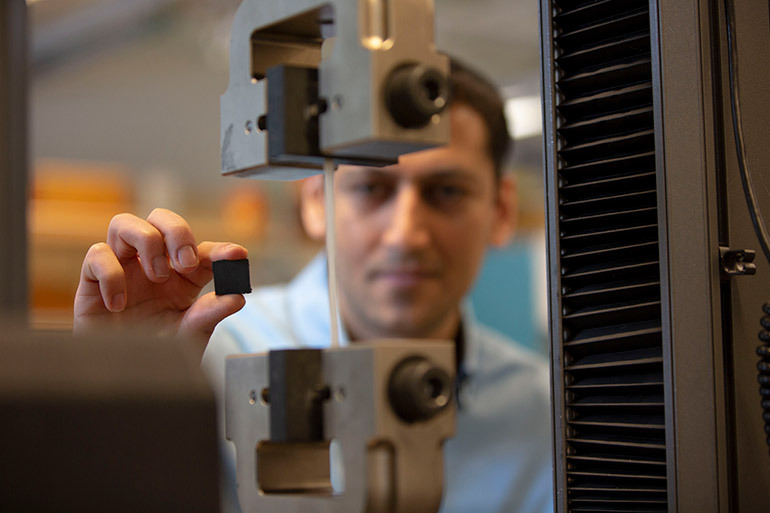 UBCO School of Engineering researcher Mohammad Arjmand examines the new polymer-based brake pad which could revolutionize braking systems in cars and trains. By mixing carbon fibres into polymer-based brakes, a group of researchers at UBC Okanagan, Sharif University of Technology in Iran and the University of Toronto were able to design brakes that are self-lubricating. These new and improved brakes can prevent wear-and-tear and have better frictional properties than brakes currently on the market, explains School of Engineering Assistant Professor Mohammad Arjmand. Brake pad materials are typically available in three categories: metallic, ceramic and organic. All have benefits and weaknesses inherent to their design such as cost, durability, noise, slow response time, or increased temperature during usage, he adds. According to statistics from the US Department of National Highway Traffic Safety Administration, the failure of vehicle components accounts for nearly two per cent of crashes and about 22 per cent of vehicle component faults are caused by brake-related problems. Arjmand says the new technology can lead to smaller brake pads that are more efficient and cost-effective since the small pads can withstand greater friction and temperatures. These discoveries are helping make cars and trains more affordable, efficient and functional, he adds. The research was recently published in Wear.